When publishing a scientific work or a textbook in a reputable publishing house, the final steps before publication usually involve signing over exclusive copyrights in a standardized manner. 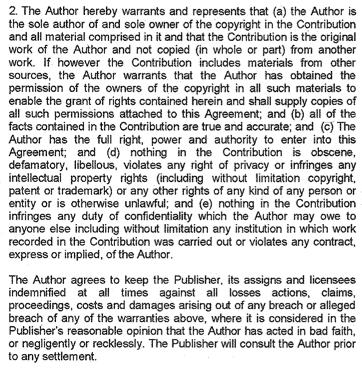 A standard clause in such copyright forms is that the author has to warrant that she either is the sole owner of the copyright in the contribution or has obtained the permission of the owners of the copyright (see Figure below, an excerpt of such a standard copyright form). While publishers thereby shift all responsibility with regard to rights clearing issues over to their authors, they regularly devote particular scrutiny to figures and tables. For any such figures and tables authors have to provide explicit permission statements. Even though including a properly referenced figure or table from another work in a scientific work or textbook could be – and probably often is – fair use (US copyright) or might be justified by exceptions for quotation, research and education (EU copyright), publishers refuse to take any risk that could be related to such a legal standpoint. Such a restrictive interpretation and enactment of copyright by publishers not only places unnecessary burdens on authors but also further worsens practicability of current copyright in academic contexts. However, as I have learned in the course of contributing to a textbook with case studies on innovation and project networks, publishers might even decide to reject figures where permission is explicitly granted in form of a standardized Creative Commons license. In this particular case, in a spreadsheet entitled “permission queries”, the publisher listed all exhibits that were considered in any way problematic. 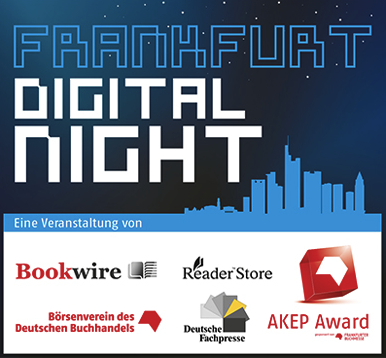 A while ago I gave a talk at the “Frankfurt Digital Night” at this year’s Frankfurt Book fair, making essentially three points: first, publishing requires – and has always required – to create and court communities of readers. Second, there are new digital tools emerging for creating and courting these communities. Third, in this context, openness in terms of APIs is becoming a feature. Even long before the advent of the internet, probably even before the invention of the printing press with movable type, publishing was essentially a social network business, with strong network effects. The Matthew Principle lies at the heart of the dynamics leading to bestsellers: „For unto every one that hath shall be given.” – what is popular becomes even more popular. And the reason is that the utility – the reading pleasure – of the individual reader not only depends on how well written a book is, but also on whether he or she is able to share this experience with others. Paradoxically, reading books combines solipstic and social practices. From a publisher‘s perspective, the social aspect is probably much more important than the solipsistic one. Because sharing the joy of reading a certain book makes others buy and read the book as well. And all bestsellers in the history – from the Gutenberg Bible over Harry Potter to Shades of Grey – were to some degree viral, rooting in social practices related to reading a book.